Location-Based Games are games in which the gameplay involves moving around an actual physical environment. The particular mechanics associated with this may differ significantly between titles, and can involve chase mechanics (such as Can You See Me Now? or Zombies Run!) or collection mechanics (such as Pac-Manhattan), territorial mechanics (such as Paranormal Activity: Sanctuary) and conventional fantasy RPG mechanics of combat, levelling and skill specialization (such as Shadow Cities). Despite the range of mechanics used, titles tend to be heavy on gameplay and light on narrative. The games we make at my game studio Haunted Planet Studios are different in their ambition in this regard, and in this and a few follow-up posts, I will discuss some of the ways in which we try and tell stories with our recent titles. Haunted Planet is a smartphone gaming platform designed for mystery adventure games that are location-based and use augmented reality. (The photo above shows an action shot of our augmented reality view.) 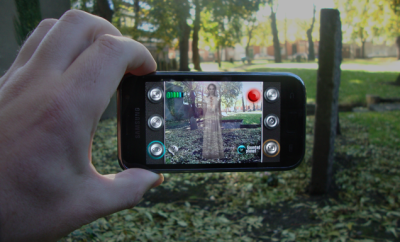 We have a pretty broad definition of augmented reality and are concerned not only with overlaying visuals on top of the real world and getting them to blend nicely with the player’s surroundings, but also with doing the same for audio, and ideally also for the underlying game world (although that is harder). Games running on our platform cast players as paranormal investigators who do what ghosthunters do: find ghosts and gather evidence for their existence in the form of photos and audio recordings. As opposed to other ghost-themed location-based games, we don’t have a territorial or chase mechanic. As a player, you do “hunt” the ghosts, but you don’t chase them around. Rather, you solve mysteries that often involve malicious paranormal entities. We think of our games as a reinvention (albeit in progress) of the traditional Gothic ghost story. Our basic narrative unit is a case (as in a case solved by a detective), and each of the games I will discuss in this blog post series constitutes one case. A case takes place in its own universe with its own characters, backstory and plot development, but several cases can of course share the same universe. The case is also an important gameplay unit and corresponds roughly to a level or a quest in other games. When a player has completed a case, they have solved a mystery and feel a sense of satisfaction. During play, our game engine stages a case, either in a specific site (such as a historical site or a theme park) where we have picked the specific location for each encounter or in a randomized fashion where the player happens to be at the time. All the cases together make up an overarching story — that the world is full of ghosts, that Earth is a haunted planet. 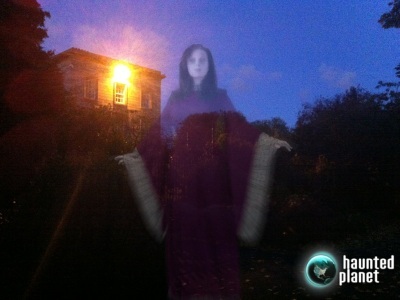 The photo above was taken by a player and constitutes a piece of paranormal evidence. The character is Silvia, who is a character from our Bram Stoker’s Vampires game that launched in October 2012 to coincide with the centenary of Stoker’s death. Silvia is one of the three vampire sisters that Johnathan Harker encounters in Count Dracula’s castle. The three are often referred to as “Dracula’s Brides” in popular media, but Stoker never referred to them as such. We have developed the three sisters as characters, given them names and backstories and constructed visuals and sound design that makes them easy to distinguish from each other. Like the Sisters in Bram Stoker’s novel are the first vampires (apart from the Count himself) that the reader encounters, so are they the first characters that the player encounters in our game. Of particular interest in this photo is the building in the background — it is the Graduates Memorial Building (GMB) in Trinity College, which is home to two of the University’s oldest and most prominent student societies: the Philosophical Society (“the Phil”) and the Historical Society (“the Hist”). Bram Stoker himself was a student at Trinity College and served as President of the Phil and Auditor of the Hist, so it is of historical relevance that the player encounters one of Stoker’s characters in this particular spot. Although it is hard to see in the photo, the GMB also makes a terrific backdrop to a ghostly encounter and greatly adds to the atmosphere. Curious readers can explore the building’s exterior (by daylight) via the Virtual Tour. The player navigates the haunted space through the use of an in-game Google Map and through the Paranormal Radar Mode shown above. 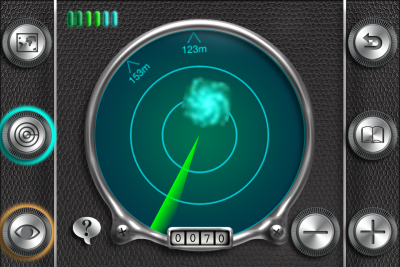 The radar works like a ship’s radar, placing the player in the center and showing the paranormal phenomena in relation to them. As the player changes their orientation, the radar rotates with them, making it easy to move towards a paranormal encounter. The photo above is another photo taken by a player. This was taken in Trinity College’s Rose Garden and features Violeta the Purple Sister. We don’t know if the Rose Garden was of particular significance to Stoker, but it is placed very centrally on the campus, so he is likely to have walked through it many times during his College years. We have structured the encounters with the three vampire sisters as parallel encounters, which means that the player can find them in any order. In game terms, this means that the player will see three blips on their paranormal radar and can choose which spot to investigate first. These parallel encounters are linked sequentially into the overall progression, meaning that the player must find all three characters in order for the subsequent encounters to be unlocked. As a narrative structure, this is a simple 3-way branching structure where the three paths join immediately. Future posts will explore narrative structure, audio and other aspects of storytelling with physical space in more depth.